The casting of this play brings together a number of talents from across the local area. Over the years, since we started touring productions in 1993, our community plays have aimed to forge links between local actors and dramatic societies, as well as to satisfy a need for the presentation of local history in an enjoyable and accessible form. Some of our members in this production are working together for the first time, others have 'been here before'. May the links we have forged grow ever stronger! Except for the first and last two scenes, the action of the play takes place in various locations in and around Liphook between the years 1916 and 1928. Flora Thompson's Lark Rise to Candleford, describing her idyllic childhood in Oxfordshire, is well known among readers of books on rural life, but her writing about the districts where she lived much of her adult life, which she called Heatherley and Peverel (Grayshott and Liphook), are less well known. 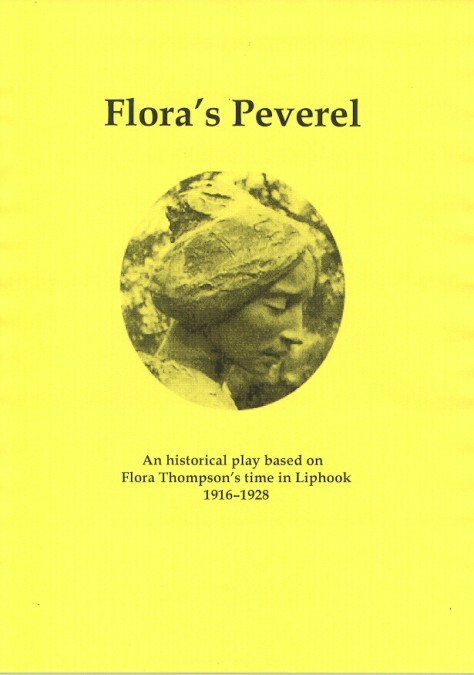 It was the second of these that formed the basis for John Owen Smith's play Flora's Peverel, which opened at the Phoenix as part of the Bordon and Whitehill Arts Festival, prior to a tour. It would be wrong to call it a dramatisation, for there is little action. Rather it is a succession of cinema-like scenes, more than 30 of them, portraying the life of the Liphook Postmistress, her family and friends, in the years during and after the First World War, with a wealth of local characters, including a tinker, a gypsy and a shepherd. In the first part we saw Flora mourning the loss of her brother in action, coping with the demands of her family and harbouring a desire to become a writer. This she finally achieves in the second, publishing poems and articles on the region's natural history. But only after leaving her beloved Griggs Green for Devonshire does she have the time to commit all her thoughts to paper. Flora was sympathetically portrayed by Mel White, gaining self-assurance throughout after seeming tied by the constraints imposed by her fastidious and straight-laced husband, played by Rod Sharp. The whole cast, which included a large number of talented young, and some very young, actors, showed great commitment to their parts and two long acts positively sped past. John Owen Smith himself directed and saw to it that each scene moved seamlessly into the next, at the same time giving a rip-roaring performance as Bill Tidy, the tinker, ably abetted by the wonderful Pru Harrold as his long-suffering wife. An unusual, but strangely involving play.